Wow, time flies! 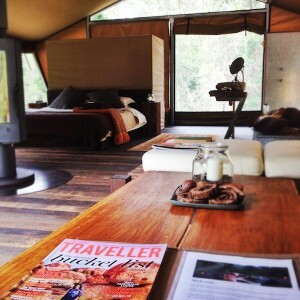 It’s almost eight months since Nightfall began taking ‘guinea pig‘ road-test guests to fine-tune our Queensland luxury camping (glamping) experience and the identity of our wilderness camp. The response continues to amaze us. Nightfall’s laid-back personalised experience touches a core. 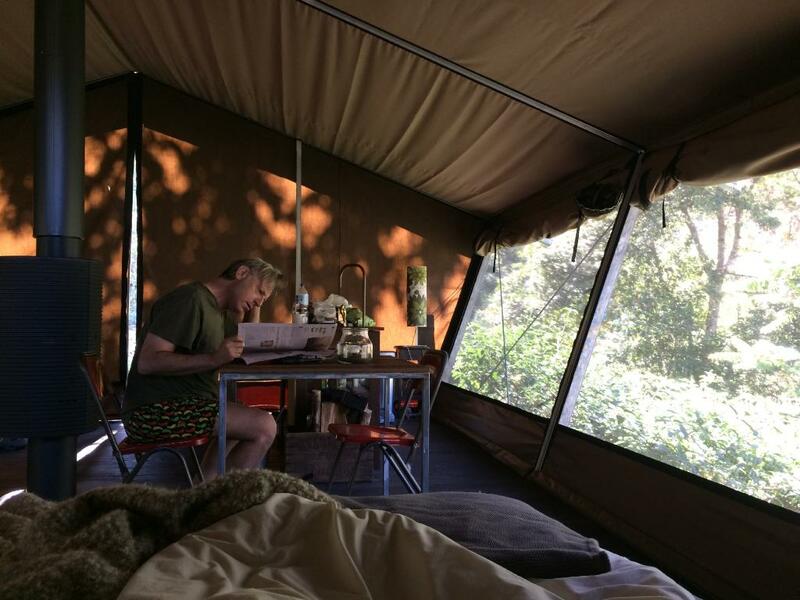 Referrals, positive reviews and returning guests mean the camp is booking well in advance – we don’t have an available night until January 2015. Through winter, the in-tent designer fireplaces were a hit. Some loved reclining in a steaming epsom-salt bath (vintage tin baths, no less), with champagne, views of the fire-place flames and the wilderness outside. 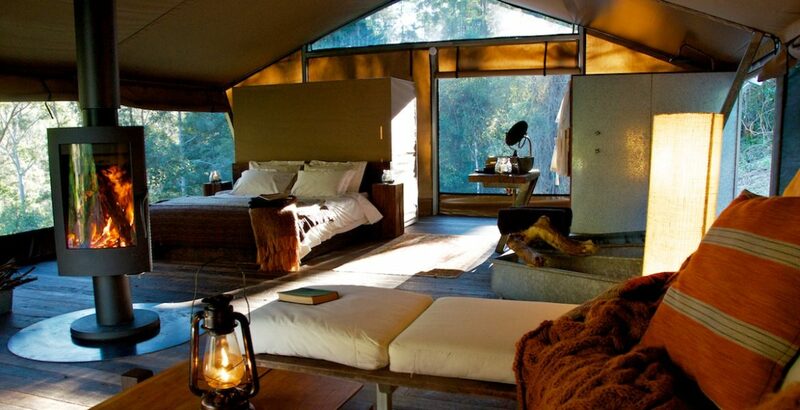 Others rotated the fireplace to face the bed, creating a cozy candle-lit under-canvas cocoon by night. Mornings were just as special, snuggled-up in bed, cuppa in-hand, watching the flames of the fireplace and the birds outside – all against the backdrop of mist swirling around the dramatic gorge rock-face. The warm weather has now shifted the focus: guests instead relish immersing in nature. The canvas walls of Nightfall’s luxury tents are almost permanently rolled-up, creating private mesh rooms which blend seamlessly with the surrounding forest. 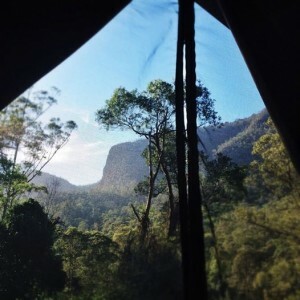 From the couch, the bed or even the generous rain-head open shower, there’s an almost unhindered view of tangled green foliage, dotted with brightly coloured parrots and the occasional shy grazing wallaby. We’ve a sense of deep satisfaction, watching the delight of our guests, walking into Nightfall’s spacious private tents for the first time. There’s universal approval of our bespoke architect-inspired design with its generous space to lounge, play or simply retreat by day or night. Many comment on the high-quality, hand-crafted, detail, including the carved rock hand-basins, hand-formed copper tap-ware, wire-brushed aged-hardwood floors and recycled bridge timber furnishings. Steve and I love to watch the stresses of daily-life lift. Faces visibly relax and glow as visitors soak-up this life where time and the everyday are not a factor. Perhaps it’s the fresh country air, or the days spent deep in the wild forests or by the creek … be it exploring or just lounging between rapids, deep swimming-holes and just reading a book and day-dreaming in the comfortable outdoor beanbags, placed in shady spots beside the tumbling waters. We now realise that perhaps we under-estimated the magic of nightall’s 1.5km private creek frontage – the water so pure you can drink it. On hot days, we all retreat to secluded shady spots or the deep cool waters – always with a nice cool drink or two. By night, we light-up the flowing waters with primitive kerosene lamps, their flames flickering like fairy lights. Dining on the Rapids has become a signature warm-weather dining experience, loved by guests. Sitting under the stars, Nightfall’s fire-cooked organic organic food and biodynamic wine tops off a truly intimate and unique occasion. The Nightfall of today is still a long way off the camp we dream of – not that our guests mind. Dry conditions (yes, in contrast to the extreme wet of last year!) have slowed landscaping and we’ve learned a few lessons about making sure we give ourselves the occasional few days without guests, ensuring there’s time to do the jobs that still need to be done. Life at Nightfall remains truly a wonderful learning adventure.